Finishing up my final quarter in graduate school has been stressful so I decided to take a whole day off to hike and clear my head. 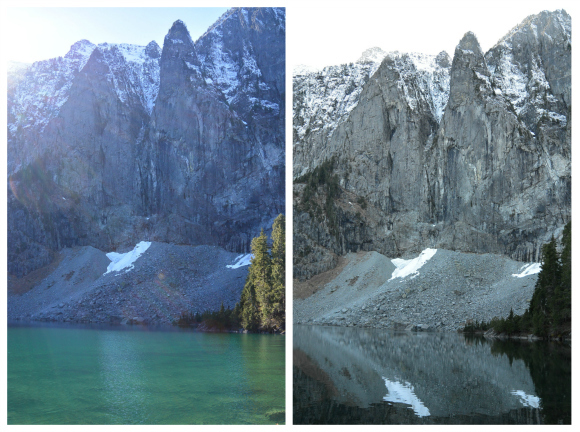 A couple of my local hiking friends were heading to Lake Serene, and I had never been, so I decided to go. It was rare to be able to go this time of year. Normally, the trail and lake are under feet of snow in late February. We have had an incredibly low snow fall in Western Washington this year though so a lot of the hiking trails are still snow free. The trail description said it was 8 miles round trip. That is about the longest distance we have hiked in a day in the last couple of years so I decided not to push Chester and left him at home. You should have seen his sad face when Gretel and I left without him. It was a good thing I left Chester at home. The trail was wide and gentle when we started out but then it got steep and rocky. 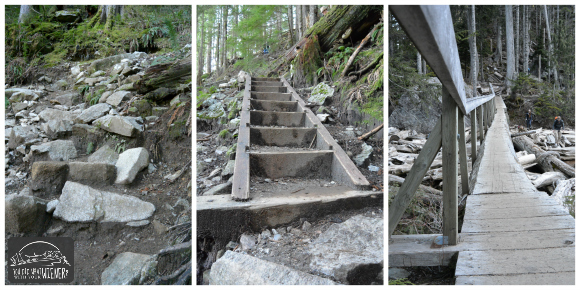 There were a lot of stairs and the trail was icy near the lake. It would have been tough going for him, and hard for me to juggle two dogs going different speeds, but my little athlete Gretel picked her way up and down the trail like a champ. We got to the lake just before the sun went down. The water was a pretty turquoise and the steep and jagged mountains were jaw dropping. The view definitely changed when the sun went down but it wasn’t any less beautiful. The water wasn’t turquoise anymore but you could see the mountains reflected in the lake. Every jagged nook and crevice on the rock wall behind the lake was now visible. There is a side trail to a waterfall on the way to Lake Serene that we were planning to do on the way back but it’s got a lot of stairs and my legs were too tired. The rest of the group hiked up there while Gretel and I sat and waited on a rock. I was snuggling Gretel in a little blanket to keep her warm. People coming down the trail looked at us and, although I didn’t, I felt like I had to explain to everyone that she is not wimp that I needed to carry on the trail. 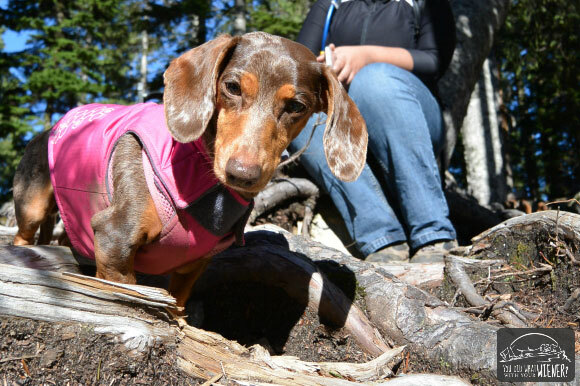 This dog-friendly trail is not a stroll in the park. Expect to work quite a bit to get to the top. The trail starts out on an old, overgrown logging road. Don’t be deceived by the wide trail and gentle grade because about halfway to Lake Serene, and the Bridal Veil Falls turnoff, the trail starts to climb steeply. You will climb 1,300 feet in the last 1.5 miles up stairs and over rocks. Don’t overlook this trail just because you have a small dog though. As long as your dog is used to hiking it will probably do fine. Gretel had no problems, except for the few large drops I had to lift her over on the way down. We saw several dogs on the trail and a couple other smaller ones – a Frenchie and a Corgi. Despite the leash law, a little less than half of the dogs we saw were on a leash. The off leash dogs were well behaved for the most part. The trailhead is 1.5-2 hours from Seattle out Highway 2 near the town of Index. We left Seattle at 815 am and got back about 7 pm. That time included driving to the trail, getting our gear ready at the car, lunch at the lake, a side hike up the spur trail to Bridal Veil Falls (for the rest of the group), stopping for a cheeseburger on the way back, and driving back to Seattle in heavy traffic. The view of the lake is definitely worth the sweat on the way up and the sore knees the day after. Looks like a wonderful place for a hike! Love the photos! Looks so beautiful. We are still hoping to get to Seattle this summer, I would love a nice hike. Yes, you really need to come out 🙂 I would love to take you on a Northwest hike. I am still bummed I missed you by days in Jackson. My friends moved from there back to Seattle but I am dreaming of a Colorado hiking trip sometime so maybe we can swing by and see you. Looks terrific! Mort says he wants to go in order to challenge the Serenity level of the lake. Come on up and I’ll take you guys 🙂 It wasn’t super Serene the day we went because of all of the people. It’s definitely better on a week day. I enjoyed your trip report. 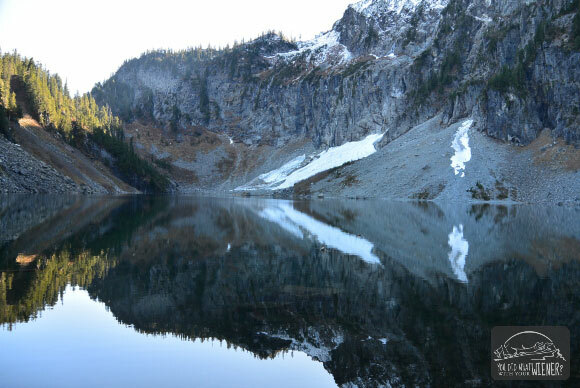 I haven’t been to Lake Serene, but looks like a hike I’d like to do. I think it’s definitely one of the must-do trails around here. Oh, WOW. It’s beautiful!!! It’s been treacherously cold here for way too long. Minne”snow”ta is making us itch for warmer weather! The Apostle Island Ice Caves just opened up on Lake Superior last weekend, and we want to go SO bad so we can post a new adventure! Your adventure looks absolutely gorgeous and serene! 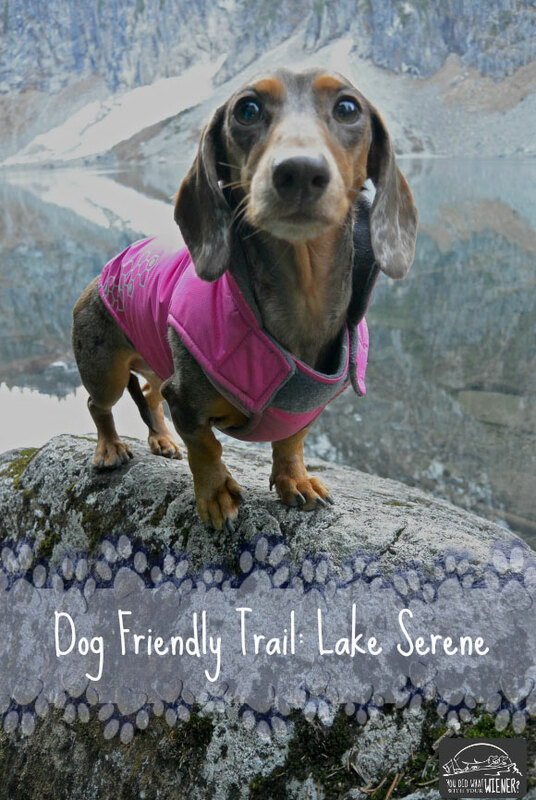 That looks like an awesome hike, and your little girl did a great job! It is too bad that 50% of the folks do not comply with leash requirements. Even if the free-range dogs were well behaved, folks that think the rules do not apply to them risk having all of us lose dog access to the trails….I know of at least one network here in New England recently closed to dogs, because irresponsible owners could not abide by rules. I also have strong anecdotal evidence that free-range dogs are responsible for 90% of the poop left on trails! ( Harder to “ignore” if your dog is on line)…and there are SO many options now for hands-free hiking….all designed to keep dogs safe, and law abiding pups. There was news that the State Parks were going to crack down on off leash dogs but this was on Forest Service land. The federal government is so strapped as it is, I doubt they can start enforcing the laws. Unfortunately, their solution might be to just shut down access to dogs one day to address the issue. The area is so dog crazy though, I don’t see that going down without a fight. How did folks handle it where you’re at? It was in NH,and I discovered that when we went to hike the trail,to complete a hiking patch program,there was a sign on a tree, saying that due to irresponsible dog owners, no more dogs. I imagine dog folks were not happy, but since it is on private land, not much can be done. There are very few leash required hiking areas in VT,NH,or ME. We have hiked some leash areas, and as you noted, no more than 50% of owners comply. They tell me they see the signs, but jut choose to ignore them. Some are blatant…i.e. Posting photos of their dogs on summit signs…on mountains in state or national parks where any dogs are prohibited. I just try to set a good example, be good trail stewards, and represent responsible dog hiking. Good for you. Me too. There are very few trails around here where dogs are not required to be on leash. That’s part of the excuse – that there is no where to go to “let your dog roam free” so they have to do it on regular trails.